Research reveals what personal information Facebook users disclose, and who discloses the most. When communicating over the internet people don’t feel the same pull towards social conformity as elsewhere. Online, people cast aside their inhibitions, worry less about the consequences of their actions and let it all hang out. Sometimes literally. Psychologists call this the online disinhibition effect and its upshot can be seen everywhere. For example, in online support groups people find they can discuss issues they would never broach face-to-face. In blog posts and comments people spew invective on matters political, religious and personal. On social networking sites they list home numbers, friends, even add pictures of themselves blind drunk. Yet, meet them in person and they’d be reluctant to volunteer their own name. For good or ill, people act more freely online. Since 700 million people worldwide are now on social networking sites like Facebook and MySpace, what does this mean for our privacy, safety and for how we are viewed online? To make a start at answering these emerging questions, Nosko et al. (2010) examined how much Facebook users disclose and what types of people are likely to disclose the most. When the researchers analysed the demographics, they found that top of the online disclosing leagues were single people, who disclosed more sensitive information than those in a relationship or those who didn’t specify their relationship status. This ties in with the finding that compared to face-to-face daters, online daters disclose more personal information, more quickly. 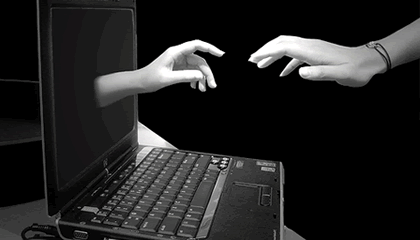 The online disinhibition effect seems to accelerate disclosure between people. They also found that younger people tended to disclose more online while older people were more cautious, as might be expected. Finally, and somewhat surprisingly, men and women did not differ in the amount disclosed online. The research generally finds that women disclose freely to each other while men keep schtum about their private lives. Online, though, perhaps men feel less pressure to conform to social norms. The fact that people disclose so much information about themselves on Facebook shows the online disinhibition effect in action. What this research reveals is that young people and those looking for connections online are likely to disclose the most information. Despite these debates often being couched in terms of fear of others and transgressions of privacy, what’s often forgotten is the simple fact that self-disclosure is the first step towards intimacy, something we all need. Still, it’s a potential vulnerability that relationship seekers might bear in mind.